I have heard an apt description that fishkeeping is nothing more than ‘waterkeeping’, which is to say, making the water conditions for your fish favorable to thier needs. 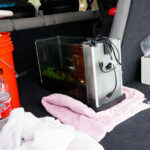 For many of us, this starts with a good product to treat the tapwater we use in our aquariums. Since I have gotten back into the hobby, I have used Seachem Prime to condition my water and I wanted to discuss the product and how to use it. Water Conditioner – Who Needs it and What Does it Do? Tapwater is generally good enough for many types of fish that are kept in home aquariums, although some hobbiest choose to further prepare it for their aquariums by purifying through a reverse-osmosis filter or by using additives to change the ph, it is great if you can get away with just using tap water. What is not good is the additives that municipalities add to drinking water. The two biggest offenders present in tap water are chlorine and chloramine. Both are an effort to provide drinking water that is not subject to growing water-borne diseases. They hurt the critters in your aquarium in a few ways. First, they are toxic to fish and the compounds disrupt the function of their gills and how they transfer necessary oxygen to their bodies. Second, being that it is a compound designed to kill bacteria, chlorine will kill the beneficial bacteria necessary for a healthy aquarium. If the fish and inverts survive the exposure to Chlorine they may then face the unhealthy consequence of a ‘crashed’ cycle and subsequent spike in ammonia and nitrite. Chlorine added to the drinking water at the treatment facility has a relatively fast ‘off-gas’ time. If you put tap water into a container and aerate it by mixing or using an air stone, the chlorine will dissipate and be removed within a day or two. This used to be a perfectly adequate method to preparing water for an aquarium. A new problem is presented because water treatment facilities understand the shortcomings of Chlorine so they also add the longer lasting compound Chloramine. This is a problem for fish keepers as chloramine has a much longer life and does not dissipate by simply aging water. Water treatment facilities can change the compounds that they add on a whim so it is best to use a product that will account for both chlorine and chloramine. In addition to the major problem of Chlorine and Chlorimine, there is another issue of metals that are in the water, like copper, zinc, and lead. Any of these could be picked up by the city water distribution or even in the piping inside your home. A good water conditioner will neutralize these heavy metals as well. It’s tough to give a proper review to water conditioner. I don’t have a lab to verify that it is doing what it says it is – i can’t test for before and after levels of copper, chlorine, etc. All I can point to for its effectiveness is a healthy aquarium with a working nitrogen cycle and healthy fish and shrimp. What more could I want? This is a cool added function in that if, for whatever reason, your nitrogen cycle gets fouled up and your ammonia or nitrite levels get high, you can help to alleviate these problems with Prime. I would not rely on Prime as a long term solution to water quality issues like these, but it is good to know that in a pinch it can help alleviate conditions that are dangerous to your fish and inverts. 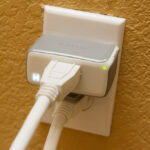 I can vouch that this product is very easy to use. I will get more into dosing below, but it is highly concentrated. Conditioning the full volume of water for my Spec V aquarium only requires 11 drops of conditioner. Because it is so concentrated, a bottle last a long time, especially for use in a nano aquarium. My initial 100 ml bottle has lasted almost 9 months at this point and I still have lots left. It is available in many sizes with the better deals (cost per volume) found with the larger quantities. When I purchase Prime again, I will get the 500ml bottle as it seems to be the best deal without buying a very large quantity. I keep mine in the kitchen near the fish tank so it will be ready quickly if I need it. The only negative I can think of for this product is that it stinks with a strong sulfur smell. When I use it, I dose quickly and get the cap back on to limit the stank. It would be nice if Seachem could include a better way to dose their product. They mention using the cap as a measuring cup (like other of their products like Excel) but this is not accurate for a smaller aquarium. If they could incorporate some sort of syringe into the cap for more precise metering that would be very helpful. 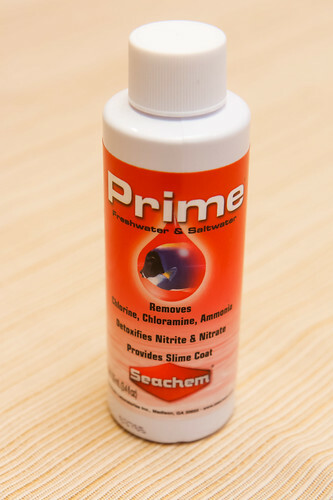 Seachem prime is a simple product to use. Their recommended dosage to condition water is 5 ml of Seachem Prime for every 200 Liters of water you are treating. 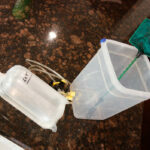 The only twist for dosing relates to water changes and adding tap water directly to the aquarium. If you choose to add tap water directly to your aquarium, you need to add a dose adequate to treat the entire volume of your aquarium. For example, when I am adding make-up water to my aquarium, I fill a tupperware container with tap water and add the sachem to that container. I only have to treat for that volume (less than a gallon). 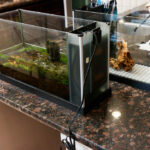 I can then add that treated water directly to my aquarium as it is safe. If, however, I am performing a 30% water change on our 5 gallon aquarium, I choose to add the tap water directly to the tank by way of my DIY water changer. I am only adding about 1-1/2 gallons, but I need to first add conditioner for the entire 5 gallon volume and then start adding the tap water. It felt strange adding tap water directly to the aquarium the first time I did it, but if you use this method, your fish and aquarium will be safe. Below is a table that gives the proper dosing for various volumes (click to enlarge). Just always keep in mind if you are treating the water outside the tank (dose only for that volume) or if you are adding tap water directly to the tank (dose for the entire volume of the tank). As best I can tell, it works instantly when you add it to water – hard to believe but I take their word on it. For dosing in a nano tank or very small quantities, I find Seachem’s direction of using “1 thread’ of a capful hard to manage. Using the cap in any form will not be all that accurate for a small tank. I would get a small syringe with ML markings, or better yet – use my method of dosing in small quantities. I don’t know what constitutes an ‘exceptionally high chloramine concentration’ or how you would know this. My takeaway is that Prime can be safely dosed above the recommended quantity by 5 times. There is no need to dose above their recommended ratio. However, it is nice knowing that you can dose much higher and not do damage. This can be useful in a practical way: let’s say i’m doing my water change and i get distracted. Halfway through adding water I can’t remember if I actually added the water conditioner. Given Seachem’s allowance to add up to 5x as much as necessary, the decision is easy at that point – just stop what I’m doing and put in the full dosage again. I know that I’m covered and I don’t have to worry about the consequence of doubling up. I wouldn’t make it a habit of doing this, but it’s nice to know the product won’t do harm if I add a little too much. This entry was posted in Product Reviews and tagged chlorine, dose, prime, seachem, water conditioner. Bookmark the permalink. 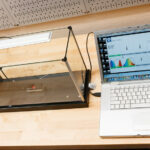 ← Using an Aquarium Cooling Fan – Does it Work? 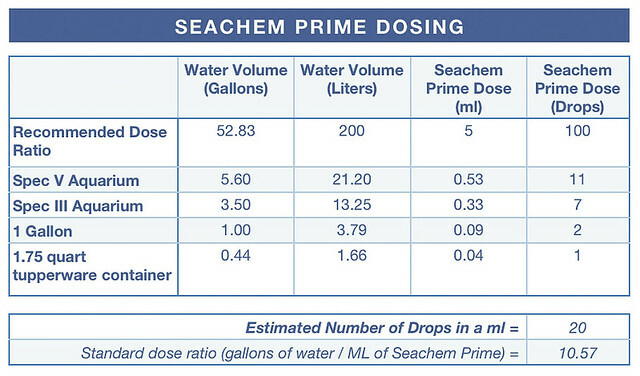 Therefore I would like to ask You if I can use Seachem Prime liquid to purify tap water for drinking ? It is 100% safe for fish (which are very demanding as regards water in aquariums) so I presume that should be safe for humans. Seachem Prime’s intended usage is for the aquarium hobby. I don’t know why you would want to use it to purify drinking water and I can’t say if this will work or if it is safe. If you need more information, contact Seachem and ask them. They have a forum on their website. Thanks for stopping by! If you are adding Prime in your water before adding it to the tank, how far in advance do you do that? I typically store tap water in a large bucket two days before water change. Then add it into the tank. At what stage should I add the Prime into that bucket? Days/hours/minutes in advance? You can dechlorinate with Seachem Prime right before you add the water to your aquarium. It works great. Since Prime binds ammonia, nitrites and nitrates is there any danger of it starving the denitrifying bacteria? Nope. Unless you dramatically overdose, that won’t happen. Can I use prime during sudden ammonia and nitrite spikes?? You can use it to dechlorinate your tank water. 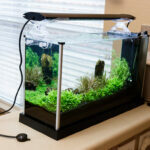 If you are thinking it will remove all the ammonia and nitrite, I’d instead suggest a large water change. Also, try to work towards alleviating the root problem. Is it a newly setup aquarium? Yes. And I have by mistake added 12 tiger barbs in it. While it is in the 2nd week of cycling… I am doing a daily water change of 10-15%. All my barbs are still alive and acting normally…no noticeable infections or symptoms of ammonia poisoning yet…but I am verymuch concerned whether they are going to make it all the way through… I am also adding stresszyme and a micro bacteria solution to make the process faster.. During the nights my barbs sort of floats in the water with their head pointing downwards at a 45degree angle…I don’t know whether or not it is their sleeping posture or not..but I am not sure…every morning till now all my barbs play around normally..and eating habits are also good..I have a 20 gallon tank with a h300 hang on the back mechanical power filter with a bio pad…I have also built a diy bio filter and filled it with ceramic rings and a sponge..this setup I am having for 2 weeks now…I added the barbs about a week ago roughly..My water looks crystal clear.. My tank is planted..right now I am having 9 amazon swords and 6 or 7 anubias along with 4 to 5 aponogeton bulbs.. My plants are doing good more or less..new leaf sprouting from my swords and anubias..even the bulbs are sprouting. I have a 24 watt led planted aquarium led light which I am keeping on for 6-7 hours every day.. Couple of days back I am noticing a light fishy sort of odour coming from my tank.. My water is well areated and constantly circulating thnx to my hob and bio filter. I am keeping both my filters on 24*7.. their is a lot of surface area..its an open tank. But I am considering using prime during my daily water changes..just to be more safe… I tested my tank water today with ammonia testing kit. The readings are 4mg/l(sample water turned dark greenish during the test)..please tell me what to do..I am very much looking forward for some sort of guidelines to prevent any of my fish dying..
Oh yes..and I am using a tetra aquasafe dechlorinator as well during the water changes…and following recommended dosing. First of all, are you sure your test kit is accurate? test your tap water straight just to make sure. If ammonia is truly that high, 10-15% water changes won’t cut it. Do large water changes – 75% is what I would do as a start. Let the water settle for a day (just in case your tap has ammonium that throws off the test) and test for ammonia. If it is still high, repeat with 50% water changes until ammonia test is low. Ride it out until your tank cycles. I might have missed this in your response: did you add filter media from your old tank to the new one?